I am so proud to say that I have been rocking the Cinch program for three weeks now! I almost didn't weigh myself on Monday because its that time of the month and I didn't want to be all bummed out because I always gain a good 3-5 pounds. Lucky for me, I didn't gain (or lose a pound) so hopefully that means I actually lost 3-5 before Aunt Flo showed up. I'll know soon enough. So far, shakes for breakfast and lunch and a healthy dinner. I can eat a steak and baked potato along with veggies and still lose weight! The key is to workout! I have been doing my Kettleworx videos that I ADORE and they are so effective! I am sore just typing this. I can see my shorts getting really loose and my arms are tightening up! 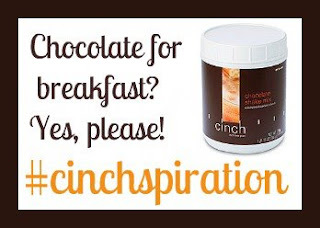 I am Cinching-it and Loving it! Keep up the FANTASTIC work!! Can't wait for the next update! !